This article is a stub. You can help Space Engineers Wiki by expanding it. The Fighter Ship, although slightly outdated. An early version the Fighter. 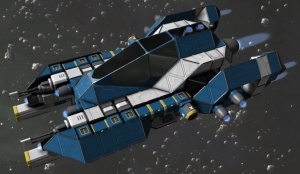 The Fighter is a small pre-fabricated military ship found on Easy Start 1 and Easy Start 2 - akin to a space fighter jet. It's a relatively well designed fighter craft with combat against other vessels in mind, with twin forward facing Gatling Guns and twin Rocket Launchers. 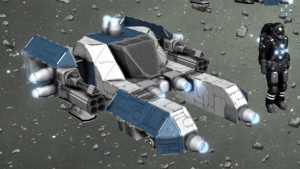 The ship's basic design should provide the basis for any other player designed fighter ships, most notably with mutliple redundancy in mind although the ship's glaring weakness in actual combat is it's all Light Armor Block construction leaving it very vulnerable to Gatling rounds and missile hits. 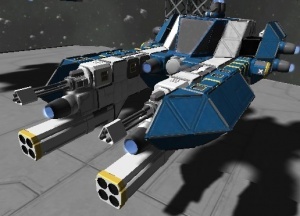 2 Gatling Guns connected via small conveyor to storage. 2 Rocket Launchers, as with all small rocket launchers this must be manually reloaded - so has a full combat load of 8 Missiles. Once exhausted the rockets are useless until manually reloaded. 1 Spotlights in between the rocket launcher and gatling guns under the cockpit facing forward. An oxygenated Cockpit located in between the primary weapons. 8 Small Reactors providing 4.0 MW and 1 Battery providing 4.32 MW of power, in total 8.32 MW of power at max load (and 1.08 MWh of charge). One of these - Small Reactor 4 is not connected to the Conveyor Network on-board, this is essentially designed to provide a way to jump start a ship completely deprived of fuel and battery charge. Medium Cargo Container and 6 Small Cargo Containers. 2 Gyroscopes for stability and aglity. 16 Small Thrusters and 1 Large Thruster: 5 forward (1 large thruster), 4 backwards, 2 up, 2 down, 2 left and 2 right. Connector port under the ship, with 2 Ejectors on each side. This page was last modified on 5 December 2015, at 17:55.